Does that feeling of overwhelm creep in when you least expect it? Is your mind racing a mile per minute - like mine does- just to keep up with your never ending to-do list. And god forbid if I had kids. I think it would be like the Tasmanian devil up in my brain. 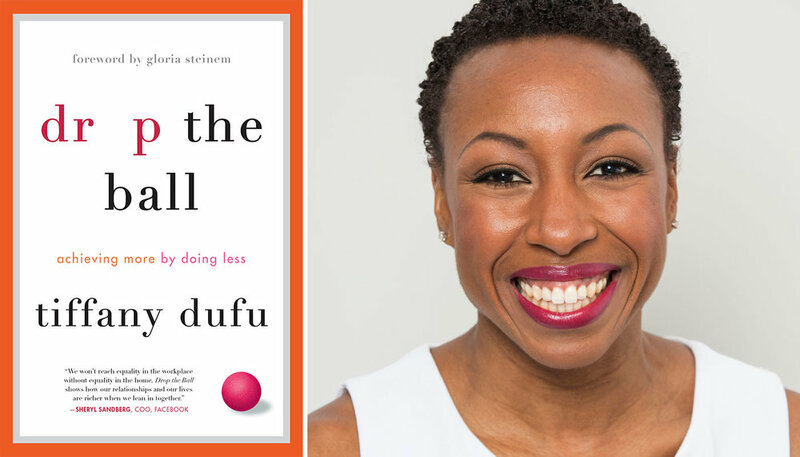 Well, women and girls activist, author and leadership expert, Tiffany Dufu just released a book to help us all quiet our to-do lists and start accepting what we can control, and let go of what we can't. It's called "Drop the Ball: Achieving more by doing less." She's actually been able to accomplish more in her life, be more fulfilled and happy at home and at work, just by doing less. But let's be clear, dropping the ball does not mean you stop caring. It's far from it. For Tiffany, she had always been a type A, overachiever in everything she took on. From the outside looking in, I'm sure people wondered how she did it all. And for a long while, Tiffany also thought she could do it all. Until one day she had her own breakdown, on her first day back to work after maternity leave, when she found herself sitting on the bathroom floor unsuccessfully pumping milk for her newborn. That's when it hit her. Something had to give. Was it really necessary for the towels to be folded perfectly? Was it in her highest interest to get the car washed once a month? Would her world fall apart if she didn't pick up the dry cleaning on the exact day it was ready? Clearly the answers were no. But then WHY do a lot of us feel like we wouldn't be the (good) mother, (good) wife, (good) sister, etc. if we didn't do these things. Where did this belief system stem from? After 8 years of meeting with thousands of women, chatting about what struggles they face in their own lives, and dropping the ball in hers, Tiffany decided to share what she's learned in her new book, Drop the Ball: Achieving More by Doing Less. It's insightful. Offers great advice and is just what you need if you want to know how to get more out of your life, by doing less. Hint: everything gets better and the sky doesn't fall! Promise. How did you end up in this line of work with Levo? Were you always an overachiever? Who's been your biggest role model over the years? What was it like working at non-profits and holding high level leadership positions? Can you remember what you were thinking when you had your breakdown? How did you figure out that your mission in life was to be a catalyst for the advancement of women and girls? You say you recently realized that you are actually an introvert - what changed? How has dropping the ball affected your personal and professional life?